The week is finally going to end. Phew! Fridays are my favorite day usually. But not this time. My dad is going through a spinal cord surgery today and am in a lot of stress since the past one week. Am writing this post just to calm myself down and think about something else 😓. I hope everything goes well and my dad will be able to resume life normally after the operation. If any one of you guys know anything about spinal cord surgery, the after-effects, precautions, etc, do let me know. 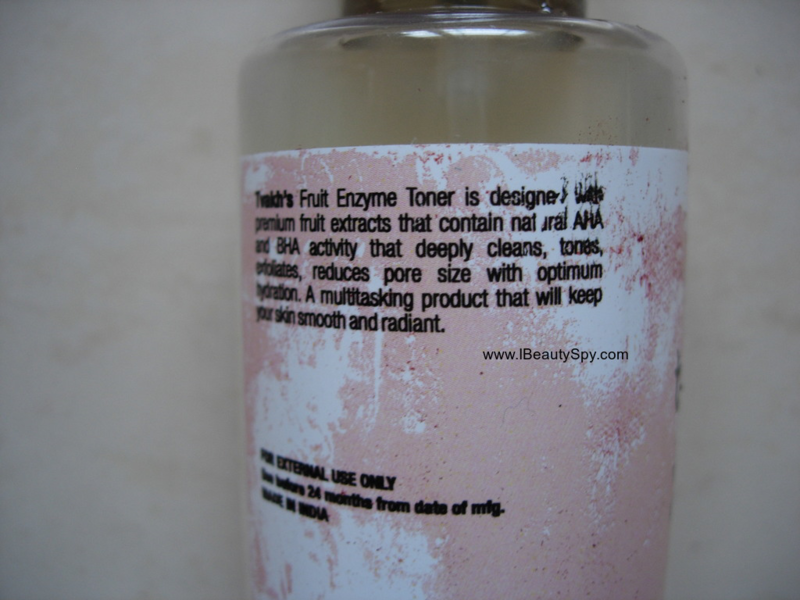 Anyway, today let’s see the review of Tvakh Fruit Enzyme Alcohol Free Toner. Tvakh’s Fruit Enzyme Toner is designed with premium fruit extracts that contain natural AHA and BHA activity that deeply cleans, tones, exfoliates, reduces pore size with optimum hydration. A multitasking product that will keep your skin smooth and radiant. Aqua, Rosa Centifolia (Rose) Hydrosol, Aloe Barbadensis (Aloe) Leaf Juice*, Glycerin, Citrus Aurantium Dulcis (Orange) Peel extract, Lavandula Angustifolia (Lavender) flower water*, Punica Granatum (Pomegranate) ext, Rubus Bruticosus (Blackberry) fruit extract, D-Panthenol, Sodium PCA,Water and Sodium Levulinate and Potassium Sorbate, Disodium EDTA, Parfum. Tvakh Fruit Enzyme Alcohol Free Toner comes in a simple transparent plastic bottle with a pump packaging. The pump dispenses the product in spray form. 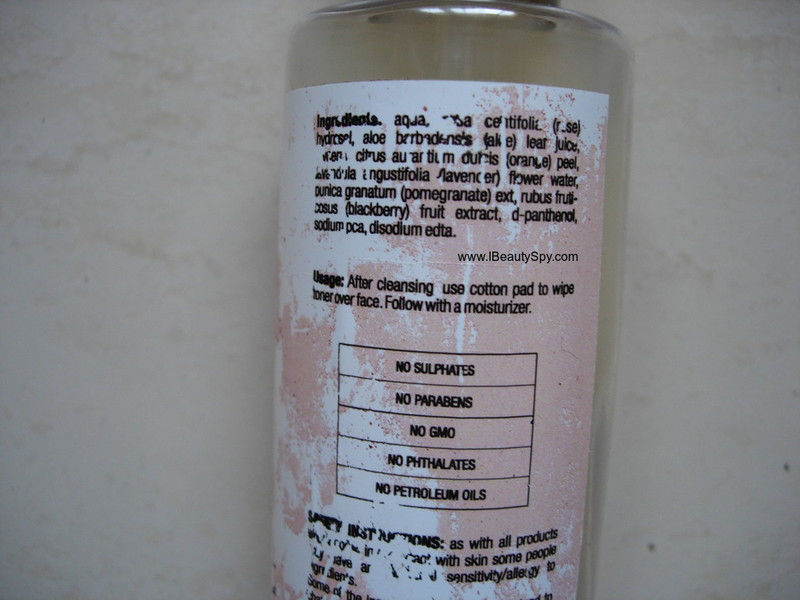 Tvakh Fruit Enzyme Alcohol Free Toner is a clear liquid, just like water, as you can see in the swatch images. It has a very nice, mild fruity scent. Not overpowering or artificial. I spray few spritz of Tvakh Fruit Enzyme Alcohol Free Toner on a cotton swab and swipe all over my face. It cleanses the skin of any remaining dirt while also toning. My face feels refreshed and clear right after using. Coming to the claims of AHA and BHA, it does mildly exfoliate my skin and makes it so smooth, clarifies and improves skin texture. I can also see small reduction in my pores, but not much. I have acne-prone skin and I feel Tvakh Fruit Enzyme Alcohol Free Toner helps to control and prevent breakouts to an extent. However, I don’t find any effect on blackheads or whiteheads. Tvakh Fruit Enzyme Alcohol Free Toner doesn’t dry out my skin and hydrates it actually. There is a slight stickiness post applying which will disappear in a while. Due to this, I feel it would be suitable for all skin types. With regular use of Tvakh Fruit Enzyme Alcohol Free Toner, I can feel my skin is clear and illuminous. Due to the exfoliation, it also helps in cell turnover and slight fading of acne scars. Coming to the ingredients list, it is simply amazing. I am highly impressed that Indian brands come up with such natural and innovative products, that too at an affordable price. It contains rose hydrosol, aloe juice, orange peel extract, lavender flower extract, pomegranate extract, blackberry fruit extract – all of which are so good for skin. D-Panthenol and Sodium PCA are skin conditioning agents. Sodium Levulinate, Potassium Sorbate, Disodium EDTA are the preservatives. Parfum is added which I feel is not needed. * Free from parabens, sulphates, phthalates, petroleum oils, GMO. * No animal testing is conducted on Tvakh’s products or ingredients. * Contains so many good fruits and flowers. * Refreshes, tone and deep cleanse skin. * Provides mild exfoliation due to presence of fruit AHAs and BHAs. * Clarifies skin and makes it smooth. * With regular use, skin is clear and radiant. * Controls and prevents breakouts to an extent. * Aids in cell turnover and slight fading of acne scars due to the exfoliation effect. Yes, its reasonably priced, considering its a natural product free of parabens and other harmful chemicals. Tvakh Fruit Enzyme Alcohol Free Toner is one of the best clarifying toners I have ever used. If you are looking for a natural AHA & BHA from fruit enzymes product, then do give this a try. If you order through their website, you will also receive complimentary samples for orders above Rs.500 😀. That’s it folks! Have you tried any products from Tvakh? Do share your experiences. That’s one of your best reviews Archana.. Loved reading it.. I have normal skin so this toner would be great for me! Haven’t tried this product yet , seems good , Best part is its alcohol free . One of the best comparison post…. I bought plum green tea toner a week ago but I was skeptical whether to use that or not….. I’m going to include it in my ctm routine.